Few studies have examined the relative risk of recurrence of different stone types. The object of the present study was to evaluate the tendency for stone recurrence as a function of major mineral composition of the stones and morphological characteristics of the stones. 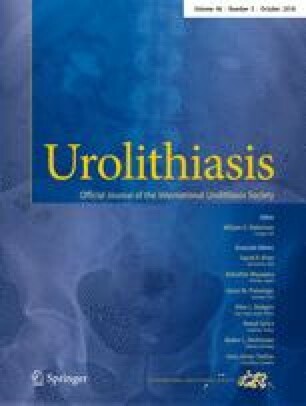 This study was carried out using 38,274 stones for which we had data available to specify if the stone was from the first or a subsequent urinary stone episode. Stones were analyzed for morphology by stereomicroscope and for composition by infrared spectroscopy. Overall, 42.7% of stones were from patients who had had a previous stone event, with these being more frequent in men (44.4%) than in women (38.9%, p < 0.0001). Age of first stone occurrence was lowest for dihydroxyadenine (15.7 ± 16.6 years) and highest for anhydrous uric acid (62.5 ± 14.9 years), with the average age of first stones of calcium oxalate falling in the middle (40.7 ± 14.6 years for calcium oxalate dihydrate, and 48.4 ± 15.1 years for calcium oxalate monohydrate, COM). By composition alone, COM was among the least recurrent of stones, with only 38.0% of COM stones coming from patients who had had a previous episode; however, when the different morphological types of COM were considered, type Ic—which displays a light color, budding surface and unorganized section—had a significantly greater rate of recurrence, at 82.4% (p < 0.0001), than did other morphologies of COM. Similarly, for stones composed of apatite, morphological type IVa2—a unique form with cracks visible beneath a glossy surface—had a higher rate of recurrence than other apatite morphologies (78.8 vs. 39–42%, p < 0.0001). Stone mineral type alone is insufficient for identifying the potential of recurrence of the stones. Instead, the addition of stone morphology may allow the diagnosis of highly recurrent stones, even among common mineral types (e.g., COM) that in general are less recurrent. All the specimens of our database were de-identified. All procedures performed in the study were in accordance with the ethical standards of the institutional research committee.